Three models available: Standard Shaft Type. Shaftless, Vertical Lift. 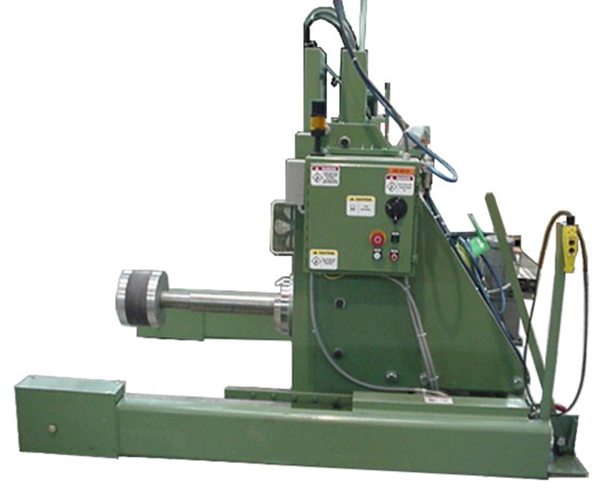 Standard Shaft type Model simple design, few adjustment features: Maximum roll widths, diameters and weights to utilize with P-line machine. 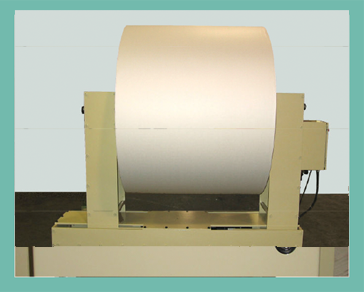 Shaftless Model offers simple design, easy operation, and automatic roll alignment with machine feed system. 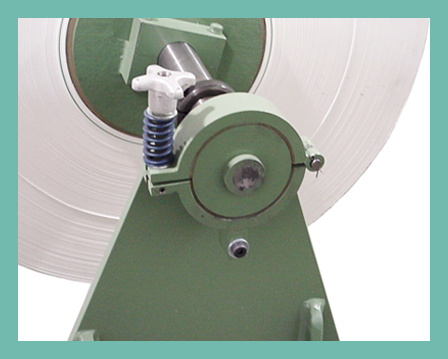 Maximum roll widths, diameters and weights to utilize with P-line machine. No pit in floor required. 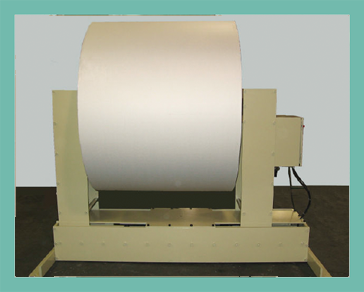 Manually adjustable pneumatic brake for paper roll tension control. 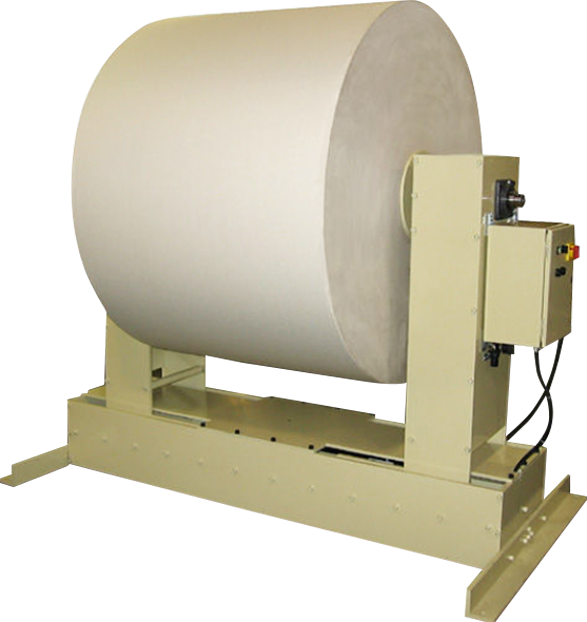 Push buttons control electric motor driven screws that shift frames individually for paper roll width adjustment or simultaneously to align the paper roll and machine feed system. 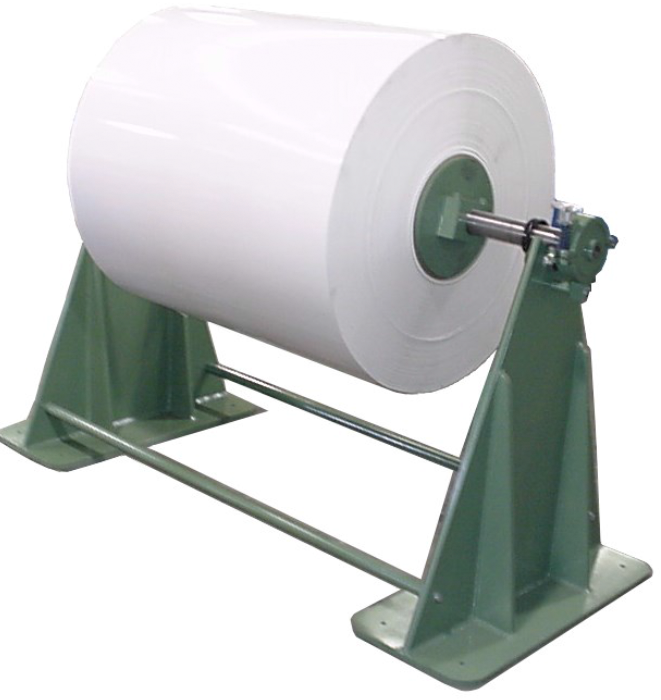 Available paper roll core sizes of 200 mm, 8” (203 mm), 300 mm, 12” (305 mm). Core sizes are not interchangeable. Roll stand guarded for operator safety. 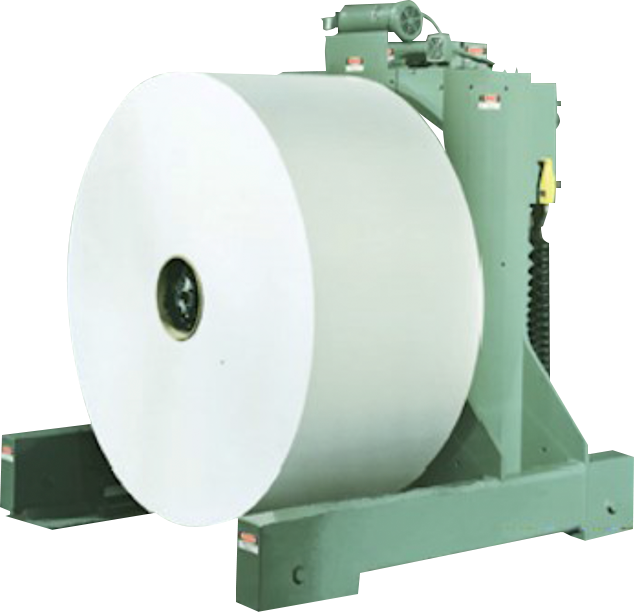 Paper rolls must be lifted unto the roll stand. Roll stand does not offer a floor pickup option. Vertical Lift models offer many features: Lateral shift, vertical lift, braking system, expandable core chuck, safety horn, et cetera. Maximum roll widths, diameters and weights to utilize with P-line machine. Motor driven rack and pinion system controls lateral shifting when engaging roll. Air disc type friction brake system controls roll tension. 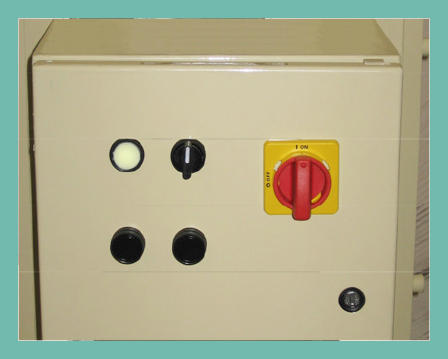 Durable construction for continuous shift operation. Dual ball screw system for vertical roll lifting provides maximum operator safety. The stand is completely guarded and includes a safety horn which sounds during operation. Roll is placed in predetermined position, and stand moves out to engage roll. Core chuck expands manually; stand lifts roll into position and retracts into place. 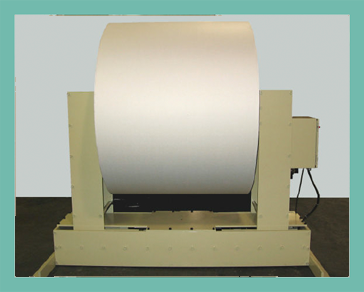 Hydraulic cylinder lifts paper roll from floor. Mechanical latch holds system in raised position. Mechanical lever system controls manual lateral shifting when engaging rolls. Manually adjustable drum type friction brake system controls roll tension. 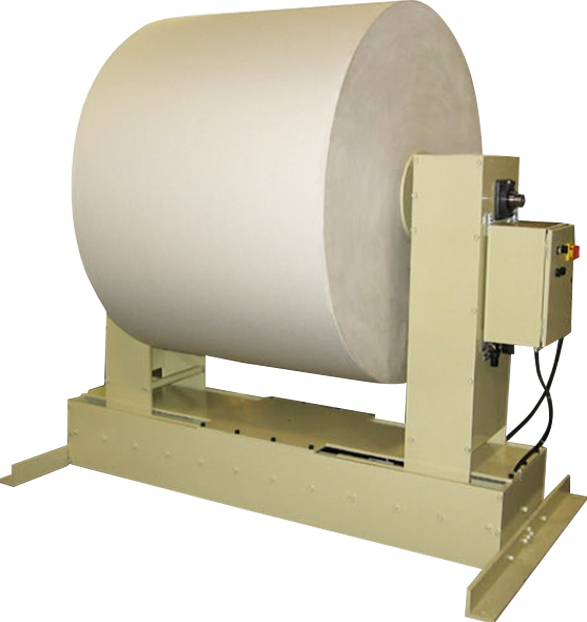 A roll is placed in a predetermined position, and the stand is manually moved out to engage the roll. 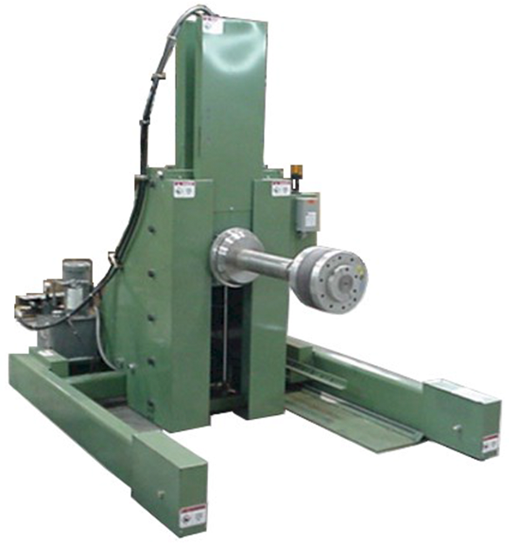 The core chuck is expanded; the roll is lifted into position, and then retracted back into place.